For day 1 of the Winter Learning Journey, my bonus activity was to make my own New Zealand flag. This was done because of the time when John Key attempted to change our New Zealand flag. 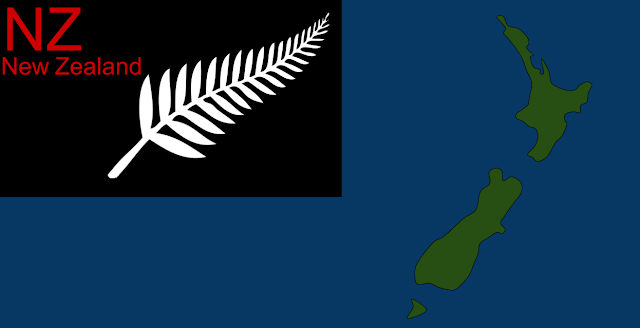 I made my flag with google drawing and found an image of a silver fern so I can get a reference and I did the same with a picture of New Zealand. It's great to see that you have completed the entire Winter Learning Journey blogging programme in only 2 days. That must be a record! I hope that you enjoyed the experience and learned a lot along the way about this awesome country that we call home, New Zealand. You have certainly created a really innovative and unique design for our new flag. I like that you have incorporated colours and symbols that really evoke feelings of New Zealand. What inspired you to include the white fern in the design? Does it remind you of something in particular? It's such a pleasure to have you back blogging with us again, Jack. You are setting an awesome example for your classmates and friends at PBS. Hopefully they will all follow in your footsteps and complete the entire journey! Yeah it is a record for me to finish in 2 day- er well actually finish all needed activities. I'd just told my parents, and they're proud of my accomplishment and the time I accomplished it knowing that not me or my brother (when he was in PBS), had ever completed the activities. I'm so thankful for you and other people that created this program for schools to learn, share, and what gave people the boost of doing so, winning prizes for their learning activities they were eligible to do. I hope this program stays strong, and can still be possible to do. It's great to hear that you were able to share the good news with your family. I am sure that both Latham and your folks would have been really impressed by your dedication and very proud of you for accomplishing such a huge task. I really hope that the programme stays strong and carries on. It is, by far, the best job that I have ever had and students, like you, make it work. So, thank you, so much! First of all, really impressive to hear you have completed all the activities (In two days! WOW). I like how you added a picture of New Zealand on your flag. It looks awesome. Keep up the amazing work Jack! Hi Jack. I am very impressed on how you were able to complete all activities in two days, I couldn't even do that. I think you have created a really cool flag. Just to let you know if you explain what each symbol represents you could get full points. Anyways, Keep up the great work. Nice flag! I like how you used something that was already made on your flag. How long did it take for you to make the flag? Hello Jack, you have created a wonderful flag. It is really creative. I also like how you explained what each part of your flag represents. Keep it up.